Have you checked out Area 1N page yet? I explain my Echelons set up [Here]. Welcome to second night level missions in Girls Frontline! 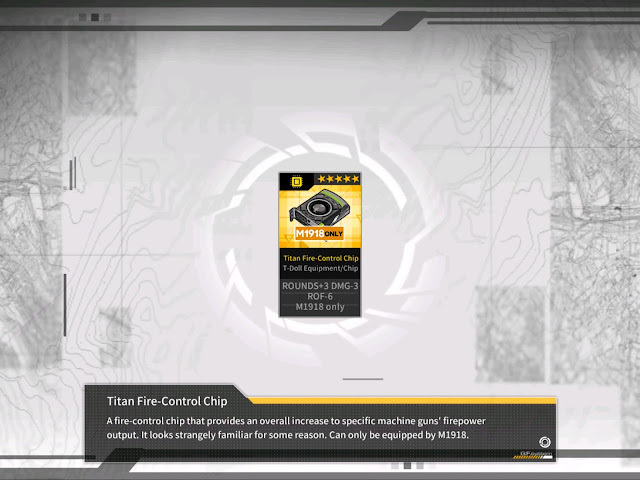 I’ll be looking to try my best to guide commanders through these missions with hopes to help unlocking equipment calibration by beating 2-4N. 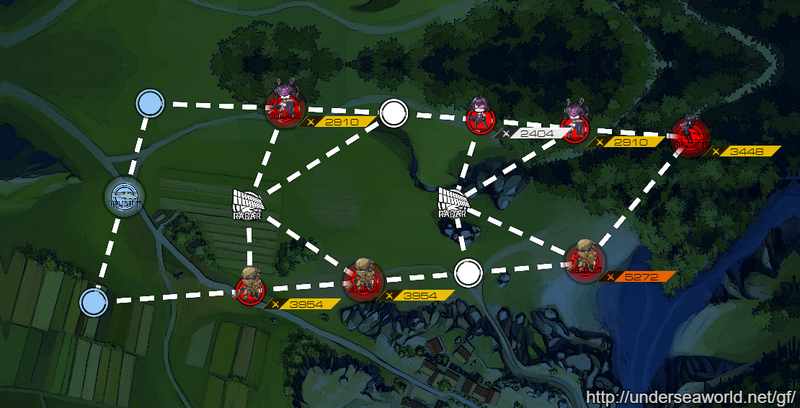 Area 2 shows relatively low difficulty change from Area 1, but gets noticeably stronger in later half of the missions. If you want to breeze through the missions, again I strongly recommend least raising 2 or 3 RF dolls to 4x link before giving it a go unless you are confident with kiting and retreating for damage control. 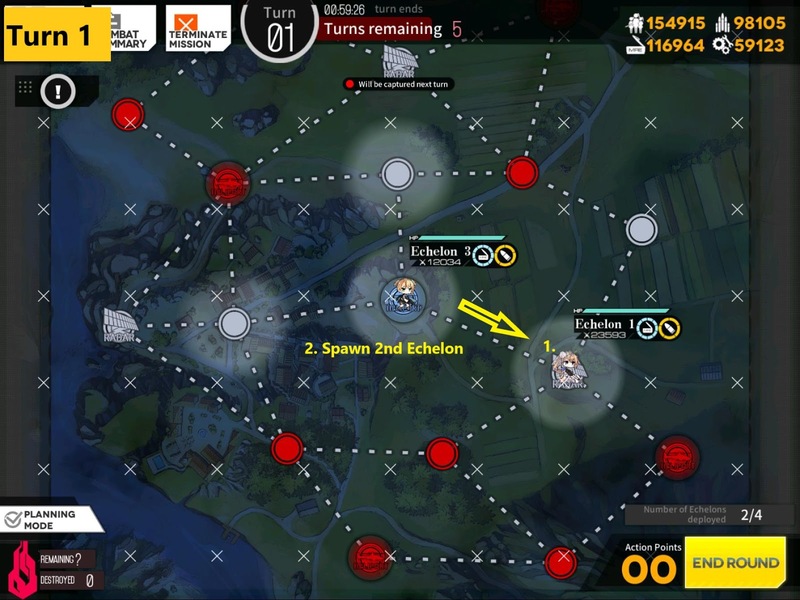 I don’t need to use Friend Echelon as much since I’m well equipped to handle these missions, but if you are having trouble, always consider using a friend echelon at a tight spot. Friend Echelon is being used to secure vision at Turn 2 since it moves forward one to connect radar with friendly node. At the starting on Turn 3, you should have full view of remaining enemy units. 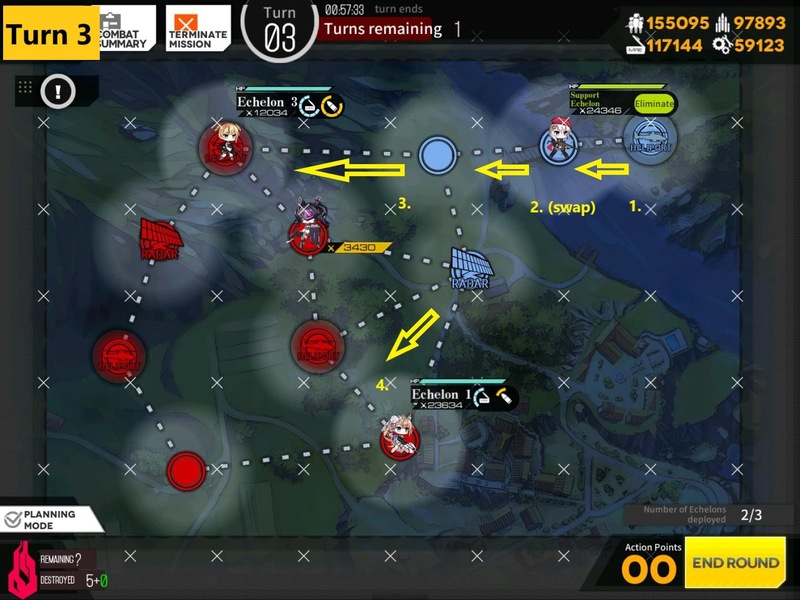 Since you have 1 extra turn, Just make sure you have enough action points to get to the rest of the enemy units. Map View: Notice positions of armor unit vs normal unit divided in two parts. 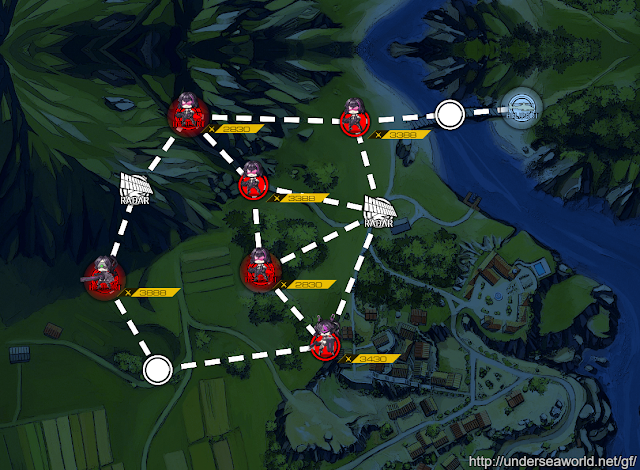 Normally I would spawn AR unit with HG but I was being lazy. Either way, first move is to take helipad within reach from starting point. 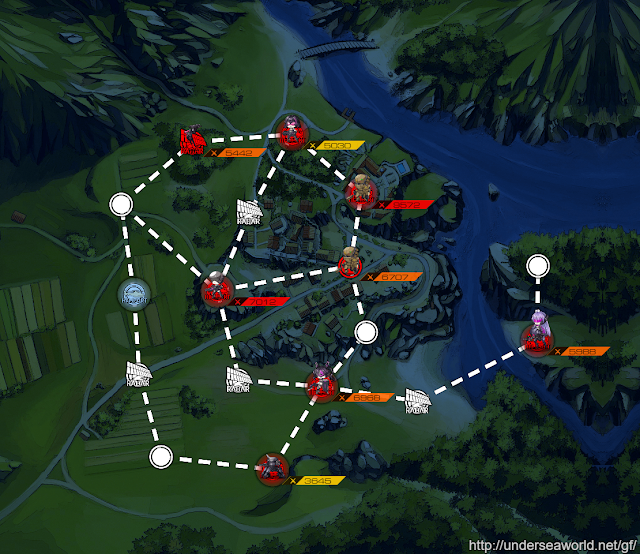 As mentioned in the map view, armor units are all on the bottom. So move AR unit 1 to right, spawn RF echelon, then move RF echelon down 1 to take radar. 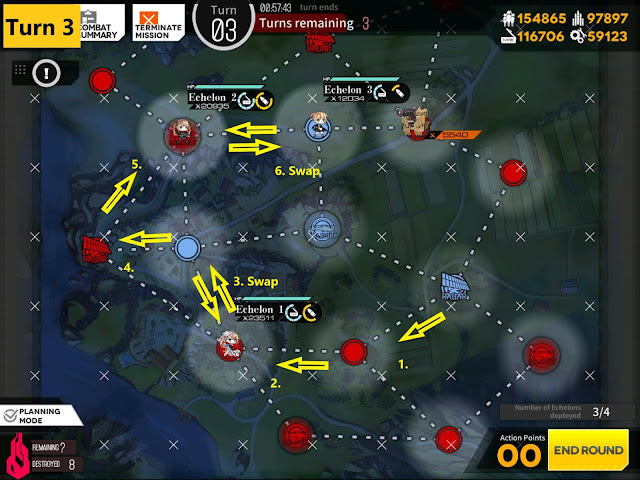 If you notice number of enemy units destroyed, we already taken down 5, with 2 remaining on board with 2 turns to go. For me, armor unit on the bottom went left instead of up or to right so I spent all my action points killing and taking helipad on the south. 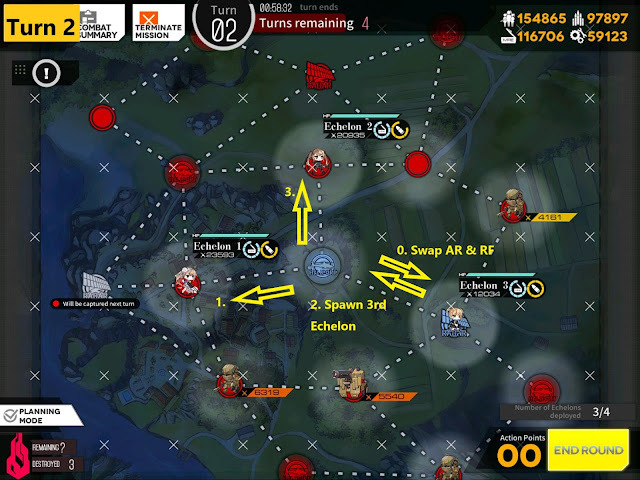 If that is not the case for you, spend spare APs to move AR echelon forward one, or spawning dummy echelon to secure additional AP next 2 turns. 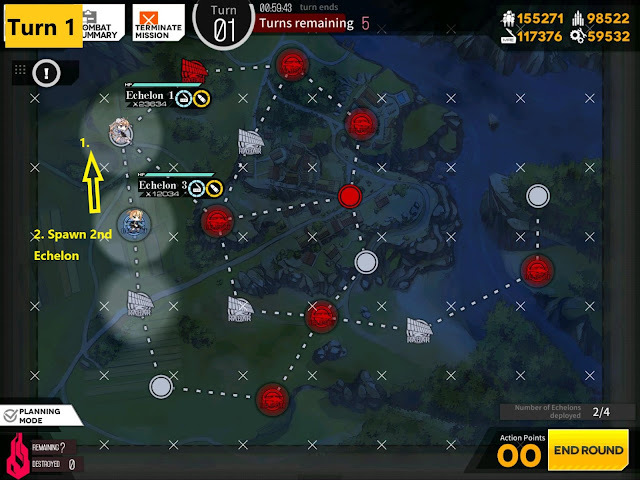 You should have plenty movements to hunt down remaining units. 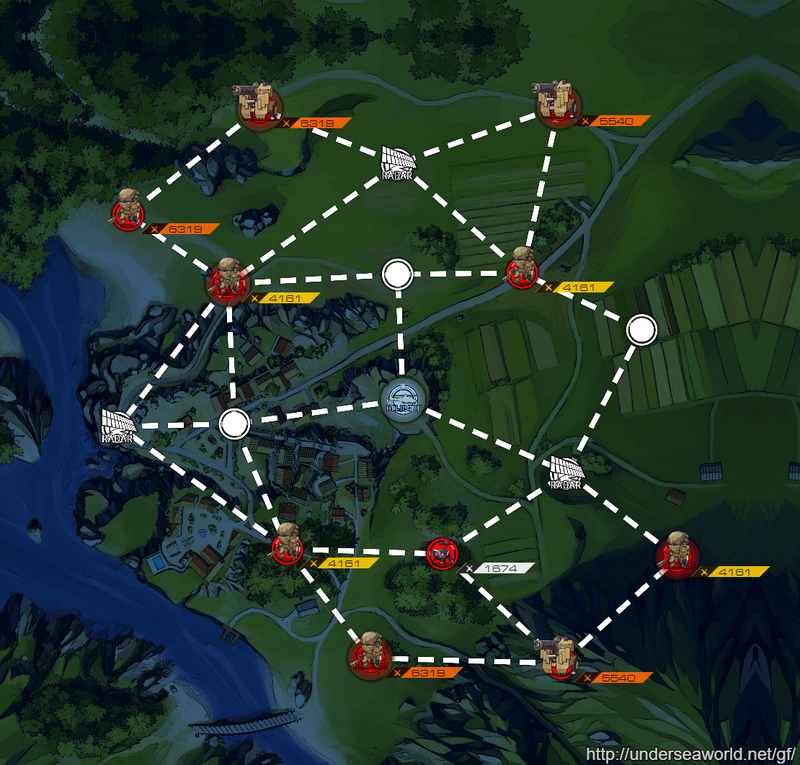 Map View.. We will talk about that dinergate later. RF echelon is not great at dealing with dinergate units. As much as they are adorable, it will eat your RF echelon alive. So get AR echelon down there. I believe it’s consistent that dinergate unit will always run towards radar node on turn 1. This is where having to come prepared comes in clutch. If you are lacking well prepared echelon, you could substitute Echelon 2’s location with friend echelon, set to “eliminate”. 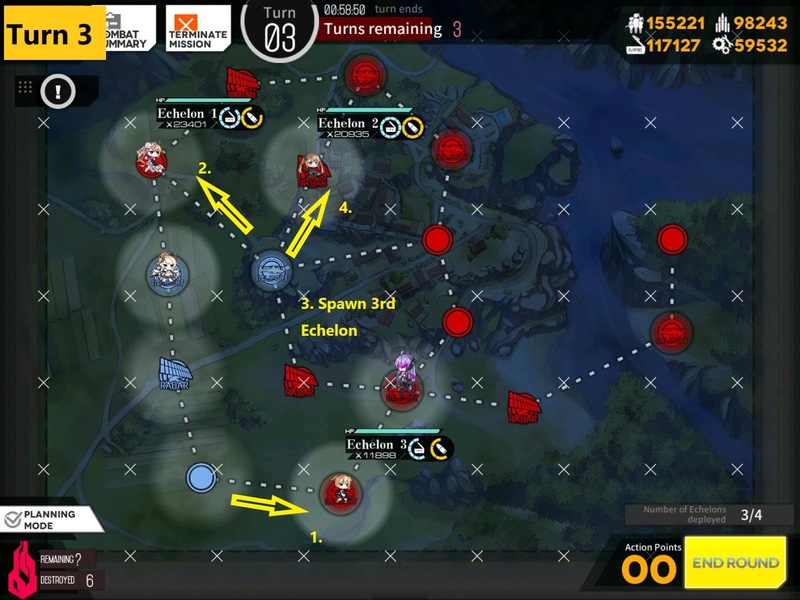 Make sure RF echelon is on radar node before ending turn. 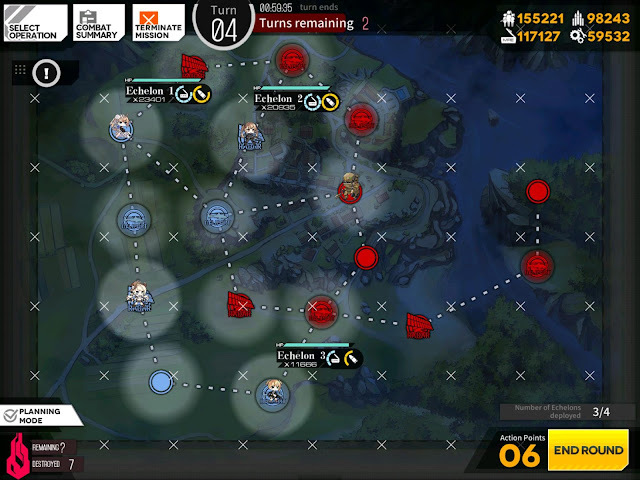 Turn 3~ 6 is all about sweep and clear. Pay attention to visible nodes and use Echelon with HG to check invisible nodes. sweep one side at a time, starting with bottom, then move counter clockwise motion. 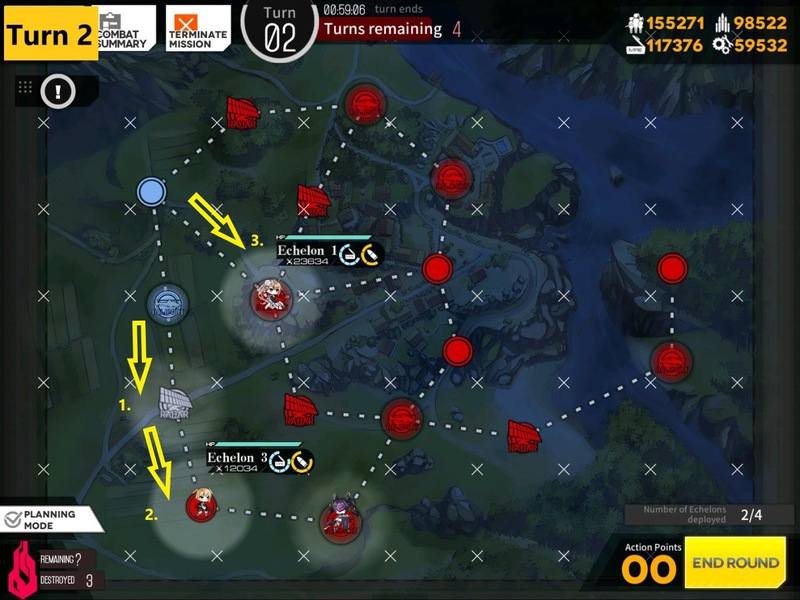 By turn 4 or 5, you should have exact idea where remaining enemy units are with plenty Action points to spare. 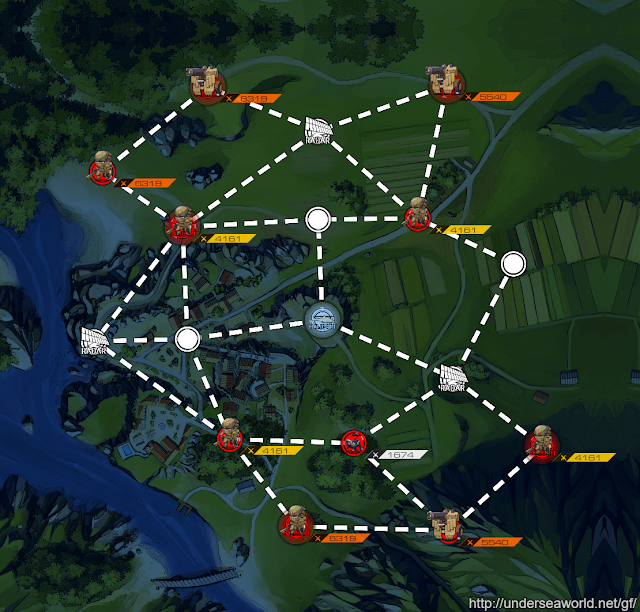 Map View: Sudden increase in enemy strength… but it’s not a Manticore at least. 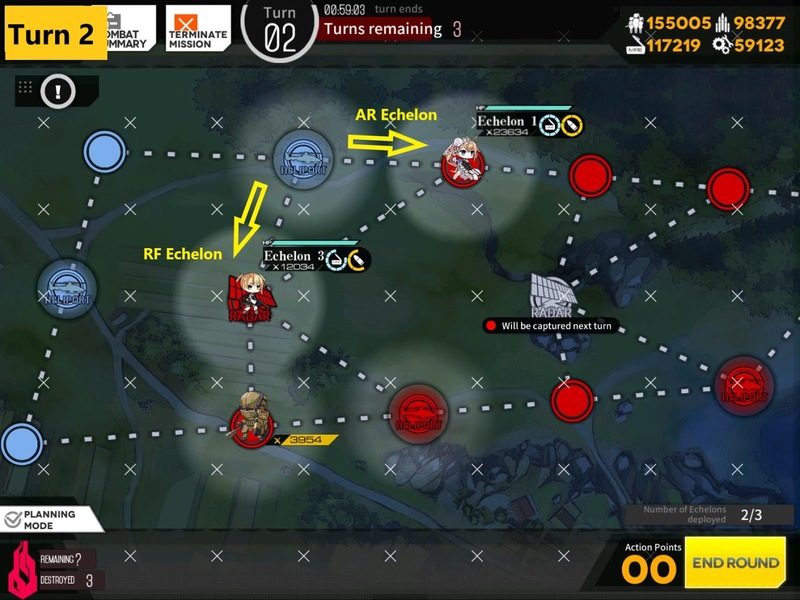 You want to make sure AR squad is at the top of helipad because it’s going to fight lot of enemies. Also RF squad should be strong enough to deal with some normal enemy units. 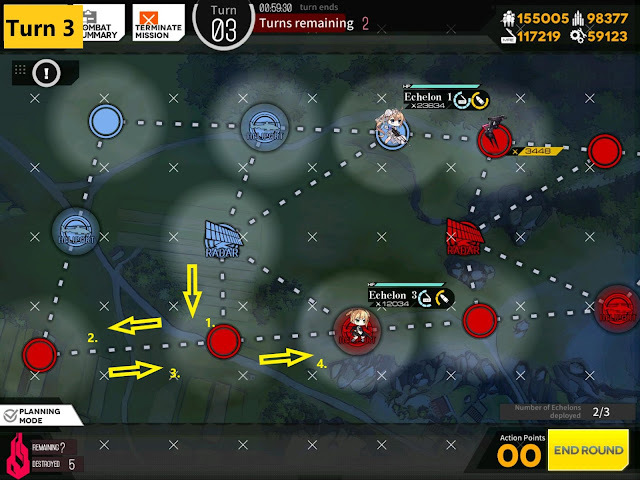 Best Solution? have all echelon to be well mixed between AR and RF. It’s not the best but it will make sure all can do the job. Taking radar at the bottom is pretty important here. AR echelon moves to take out an armor units and take helipad in the center. 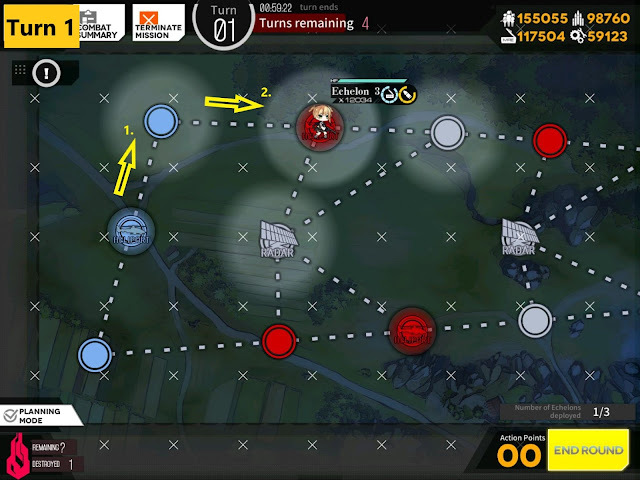 IF! 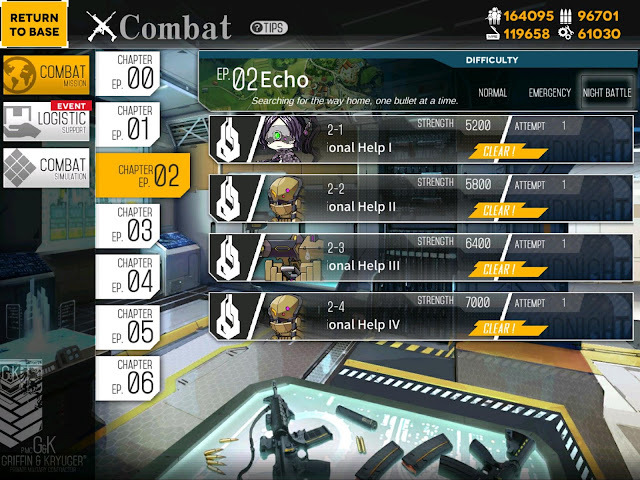 If your Ar squad have a HG, you don’t have to worry about Friend Echelon on the starting helipad. I was dumb and forgot my AR echelon didn’t had HG in it. so I had to call in an Friend Echelon with a HG to gain additional sight via swapping with AR team up north to center helipad which was dark so I can spawn 3rd Echelon to take radar up north. Don’t be dumb like me. Or you have to think extra hard to fix your problems. Beginning of turn 4 should look like this, with last remaining unit either visible or hidden in the few remaining nodes. Again you have plenty of action points left. Go get ’em.